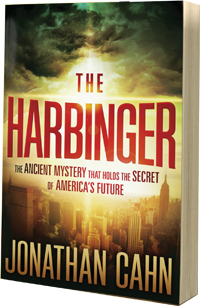 I just finished reading a book called The Harbinger, by Jonathan Cahn, and I have to be honest, I’m pretty shocked. And not for all the right reasons. So at any given moment, I’ve got multiple sections on my Kindle (sci-fi, spiritual, creature fiction, prophecy, etc.) that I can delve into at any time. 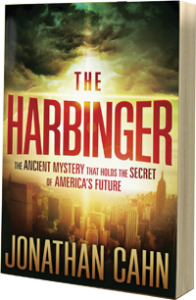 And last Friday, I was browsing the titles I hadn’t filed into a category yet, and found The Harbinger. Not having a clue what it was about, I started reading so I could slap it into the appropriate folder. Two chapters into the sample, however, and I was intrigued. Intrigued enough to consider buying the thing, so I clicked on the “Buy Book” button, expecting to be taken to the Amazon Store where I could check the price and confirm my purchase. Unfortunately, Kindles don’t work that way. Instead, I realized I had suddenly just purchased my first full-priced book for my Kindle. (Granted, at $9.99 it wasn’t back-breaking, but still… I would’ve liked a warning.) So heads up, Kindle owners – don’t click that BUY button unless you’re serious. The story’s about a journalist who has conversations with a prophet of sorts, who helps him draw startling correlations between an obscure prophecy for Israel in Isaiah 9:10 and the state of America (both past and present). As I read further into the story, this is where the shock I mentioned earlier set it. Shock #1? That the prophecy for Israel so many centuries ago actually does apply to America today. While one could argue with the sometimes thin arguments that are presented, there are enough that are rock-solid, researched and factually sound that the idea of their being coincidental are patently absurd. They are astounding, to say the least. For the record, I agree 100% with the message of the book. America is in trouble in the near future, primarily because of how far we’ve come from the spiritual origins of our nation at the beginning. Whether people like it or agree with it or not, the fact is we started as a Christian nation, dedicated to God with specific principles and statutes in place. Our present culture of compromise might very well try to neutralize and negate key portions of the Biblical basis that offend them, but not without damaging the very foundation we rely on. Remove enough threads, and eventually the rope’s gonna start to fray. My second shock, however, was almost as great as my first. Because frankly? This book is not very well written. It’s well-researched, to be sure. It’s complete and comprehensive and astounding, with the facts that are in it. But it is in desperate need of an editor to punch it up a notch. Do you need to read this book? Without question. Whether you’re a Christian, atheist, Buddhist or follower of the Flying Spaghetti Monster, if you call yourself an American this book will make you sit up and take notice. When a Biblical prophecy is this bizarrely accurate, ignoring its significance really isn’t an option. That said, The Harbinger is a decent read, just don’t expect to be wow’d by the prose or characters themselves. They’re not the main event. The message is. Hmmm…I’m intrigued! Need to check the library for a copy!